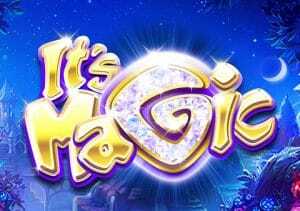 Head to an enchanted realm that’s full of surprises in It’s Magic, a 5 reel, 50 payline video slot from IGT. Look out for symbols that can magically fill reels with overlay wilds as well as a free spins and a spin the wheel feature where jackpots of 1,333 times your bet can be won. Play on your PC, tablet or mobile from between 75p and £150 per spin. It’s Magic follows on from IGT’s Icy Wilds game and comes with a similar look. You’ll see a night time scene featuring a forest and castle in the background. Joining the royal values are 3 cartoon animals, each of which offers up to 1.6 times your bet per payline. Wild Reels feature – these are central to the base game action. On any spin the monkey, cat, fox, lamp, book of spells or treasure chest can transform a normal reel into a wild reel. This turns the whole of the reel, or better still multiple reels wild for the following spin. Free Spins Bonus feature – land 3 or more of the It’s Magic logo scatter and you’ll win at least 10 free spins. The more scatters on the triggering spin, the better. If you’re lucky enough to see 18 or more scatters, then you’ll be awarded the maximum allocation of 45 free spins. If you see a scatter behind a Wild Reel it still counts toward triggering the feature. Magic Wheel Bonus feature – on any spin you could see Lily the magician appear. With a wave of her wand, she can summon the Magic Wheel Bonus feature into life. Once active, you’ll receive a single spin of the wheel. Coin wins and jackpot prizes are awarded depending on which segment the pointer stops. The ones you’ll really be wanting to see are the Jackpot segments. If the pointer stops on the Grand Jackpot a 66.66 times bet payout awaits. If it stops in the Royal Jackpot segment, you can look forward to a mighty 1,333.33 times bet reward! The magical fantasy theme might be a little on the cute side for some. If you can see past the theme, there are some decent extras on offer here. This isn’t a volatile game though. The variance is on the low side of medium. You should get plenty of play for your investment which is just as well given the minimum spin is a high 75p. IGT has delivered just what we expected in It’s Magic. We wouldn’t say it quite matches its name but It’s Magic is a well-designed and playable game, especially if you like the enchanted theme. I would rather play other IGT games with the pulsating Electric Tiger worth looking into.